One off the more interesting fighting game spinoffs from the ’90s, Puzzle Fighter still holds a special place int h hearts of many a fight fan. The Capcom published title pitted Street Fighter characters against each other in a puzzle game. When you hit combos in the puzzle game, the characters on the sides of the screen would pull off special moves on their opponent. It was a kind of indirect fighting game experience, and it was boat-loads of fun. Since then, we haven’t seen much go the IP though. That drought came to an end a few months back with the announcement of a new version of the game, this time for mobile handsets. This is no reprint though, as Capcom is promising all -new enhancements for the series’ reboot, including a “new look and new features, leaderboard support, guest account support, Color Blind Mode option (a series’ first) and more”. Ready to brawl? 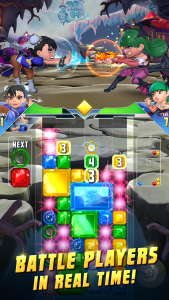 Watch for Puzzle Fighter to arrive on iOS and Android devices “later this week”.